Scrub potatoes; wrap in heavy-duty foil. Prick potatoes with fork (through foil) to allow steam to escape. When ready to cook, bake potatoes over campfire coals for 1 hour or until fork-tender, turning frequently. Meanwhile, in small skillet, brown ground beef; drain. Stir in cheese and salsa. (Cheese will not melt completely). Remove foil from potatoes. Cut x-shaped slit in top of each potato. Gently squeeze lower portion of potato to force cooked potato up through slit. Spoon beef mixture over potatoes. Top with sour cream; sprinkle with onions. The low moisture and high starch content of russet potatoes make them perfect baking potatoes. 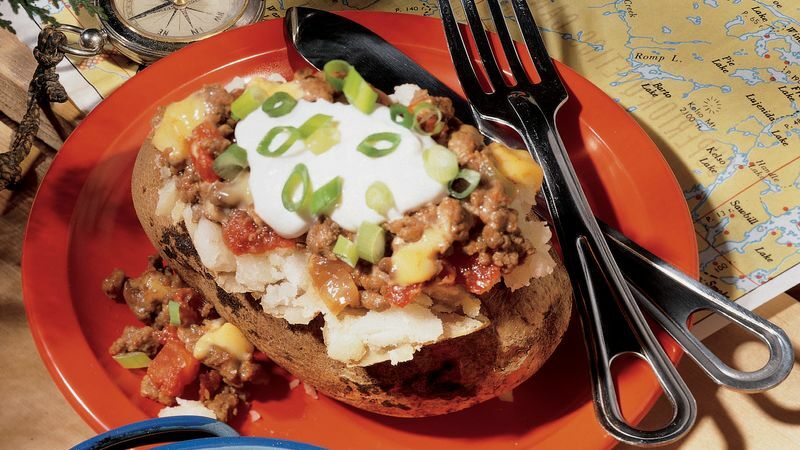 Use lean ground turkey and nonfat sour cream to cut about 5 grams of fat from each serving. Enjoy these hearty potatoes with thick slices of grilled buttered French bread, carrot and celery sticks and sliced cucumbers.